Home / Business and Marketing / Travel and Living / Fare Warning! Spicejet Spiceflex fare is complete ripoff! Fare Warning! Spicejet Spiceflex fare is complete ripoff! 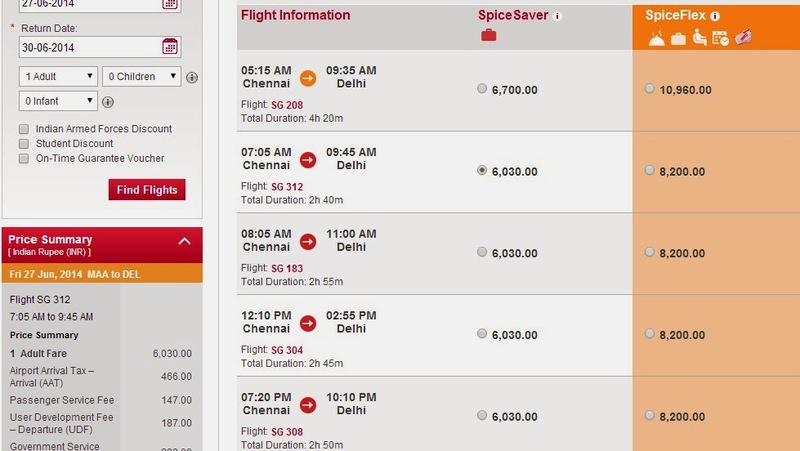 June 29 Update: Spicejet seem to have reduced the gap between regular fare (Spice supersaver) and Spiceflex. Earlier there used to be a gap of Rs 2000-4000, now the gap is down to Rs 749-1500 on the sectors and dates I checked. For many of us traveling with personal money, biggest nightmare is having to change our travel dates last minute. We book well ahead hoping to make use of low fares, but end up loosing money in date changes and cancellation fees due to last minute uncertainties. Leaves might not get approved, some family emergency may arise or some other event may force us to reschedule our travel. Now such a move costs lots of money. 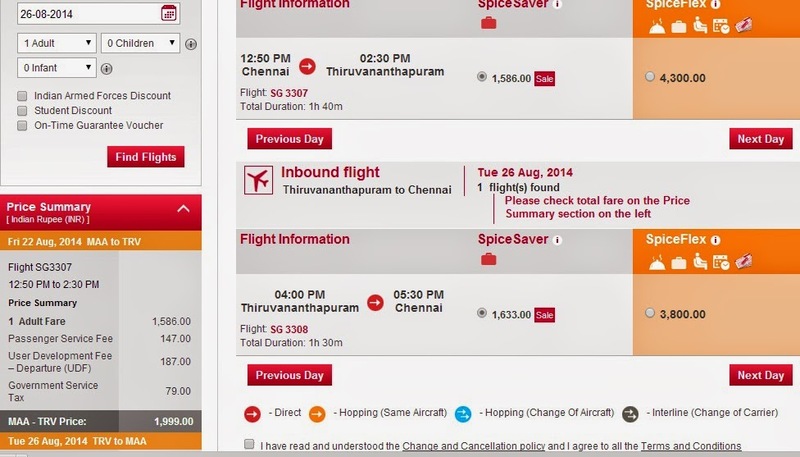 Airlines charge Rs 1500 for each date change one way + difference in fares. So a rescheduling of round trip domestic flight can easily set you back by 5-10k rupees or more, based on various factors. Today Spicejet announced a Spiceflexi fare scheme, under which it is said that there'll be no fees for change of dates and few other benefits. At first I thought it is a good deal. But when I dug out the details, this new spiceflexi fare looks like a rip off and just not worth the hype. You'll save more if you book regular ticket. Officially, Spiceflex gives you following benefit- free meal, priority check in, no change fee if you wish to change your travel dates and a provision to select a normal seat. This might sound tempting, but to understand the catch, read further. In reality, spiceflex is an invitation to "pay more and keep paying more". There’s no way to value how much a priority check in is worth. (One of the spicejet ad pegs it at Rs 300) You can decide for yourself. For a budget traveler in me, even if I board the aircraft first, I will still reach the destination same time as others. They can't offer "Priority Deplaning"at destination because aisles will be crowded even before taxing stops. Spiceflex fare costs 30-40% more than normal fare. This translates to an amount of INR 2k to 4k on most of the routes. The above advantages are just not worth this much premium. Apart from the difference you seen on screen, there's another 5% extra to be paid in form of Govt service tax. If I am not very certain about my travel dates and need to reschedule my trip, isn't it worth paying a premium, so that I can save during rescheduling? I though so. If one reschedules 2-3 times, then there could be savings compared to normal ticket, where for each change Rs 1500 needs to paid. But the catch with spiceflex is that new ticket also has to be Spiceflex. You can't change to a normal ticket from spiceflex. That means when you pay the price difference, you'll end up paying a premium fare one more time. If you've noticed in Chennai-Delhi fare comparison above, when base fare is 6030, spiceflex is 8200, about 2170 Rs expensive. When base fare is 6700, which is 630 Rs more, spiceflex is Rs 10960, the difference is Rs 4260. I am better off paying Rs 1500+ Rs 630 fare difference + Rs 250 for meal, than paying 4260+5% tax for new booking, even after having paid Rs 2170+ 5% tax premium in the first place. This goes on for ever- after each change, you'll only be making the airline richer than you would have otherwise done, when on a normal ticket. So where exactly is the saving? If spicejet wishes to offer an explanation, I am willing to listen and share. Also note: You will not get spicemax benefits such as extra luggage, priority bag out and a wider premium seat. This is not the first time spicejet is introducing such an offer. Spicejet has been periodically rolling out bundled offers which have a few value added services packaged. Stay away from this scheme, book normal tickets. Disclaimer: I've nothing against spicejet. I've booked some of their ultra cheap tickets and looking forward to my journey. However, this particular fare scheme didn't sound right, hence I am sharing my observations. If only there were some scenarios in which customer would have saved some money, this scheme would have some value. if I am missing something, pls let me know. Some offers are mere commercial stunts and will die out. I like Spicejet anyway; they offer good service at reasonable rates. @Tomichan: Yes, no complaints on their service.